YOU may not have noticed unless you live in the area, but in the past week the former Cherry Orchard Middle School has been bulldozed. Since closing as a 400+ pupil middle almost eight years ago, and briefly becoming an annex for Weston Favell School, the site has fallen into terrible disrepair and become a haven for wildlife. After the council’s first Big School Sale fell through, they’ve spent goodness only knows how much on security, and the grounds became overgrown and the windows broken. The only visitors were vandals, a security guard, and members of the police dog unit who used it for training exercises. I know this because I have an allotment just over the wall and was regularly ‘surprised’ (scared witless) by a loud voice shouting “DOWN! Get down on the ground, put your hands where I can see them!” (or words to that effect). I stopped hiding in the shed and calling the police after about the third time it happened. In recent weeks things have started to happen very quickly, as the council sold the site for houses and the contractors moved in. The rear grounds were fenced off, and at the front; the Birchfield Road East side, the buildings were smashed up and foundation work for the houses that will take its place began. Now trees have been removed, and the whole site looks strangely empty. For now at least, because soon it will have 160-odd new homes on the narrow site running between Wellingborough Road and Birchfield Road East. We’re hoping the row of magnificent mature trees bordering the allotment won’t be touched. I’m sure thousands of you will have spent your formative years at Cherry Orchard. It may have been the best years of your life – or not . . . 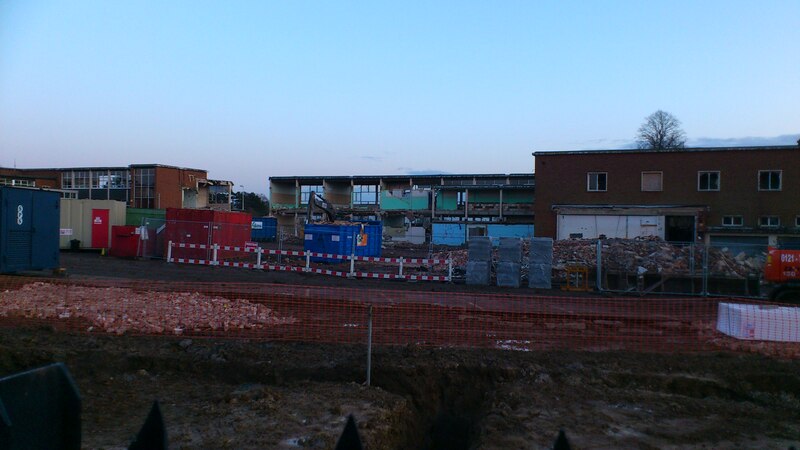 Anyone passing must have felt sadness to see a school that has stood on the site for decades simply disappear into rubble. It might not have had much history as a building – it wasn’t a red brick Victorian school with a pretty clock tower, more like a 1960s or 70s building block of a place – but it would have held plenty of memories for all the former staff and pupils, who, I believe, include politician Tony Clarke and BBC radio presenter Helen Blaby. A similar fate awaits a further 15 abandoned schools, which were said to be worth over £100 million to county council coffers when they closed almost a decade ago. Meanwhile, isn’t the council making cuts of, oh, around £100 million?